Today marks the official release of Bitcoin Core 0.17.0, the 17th generation of Bitcoin’s original software client launched by Satoshi Nakamoto almost 10 years ago and still the dominant Bitcoin implementation on the network today. Looks like 138 people contributed to the Bitcoin Core 0.17 release. An all-time high! The update includes the ability to go into "pruning mode" via the wallet, instead of using the command line. Pruning means Bitcoin validators don't have to store all 180GB of data from the Bitcoin blockchain. Historic day: Bitcoin Core 0.17 is released with one of the most awaited features: a protocol for hardware wallets and remote signing native to Bitcoin Core: PSBT (BIP174) Partially Signed Bitcoin Transactions. The Bitcoin RPC has a few new calls that allow software to ask Bitcoin core to create transactions by sending it UTXOs, which returns a PSBT file which can be signed offline with (or without) a hardware wallet, which then sends it back to bitcoin core for broadcast. Now the big question is, how many people will actually upgrade? According to Spencer Noon, 85% of nodes are still vulnerable to the recent CVE-2018-17144 bug. 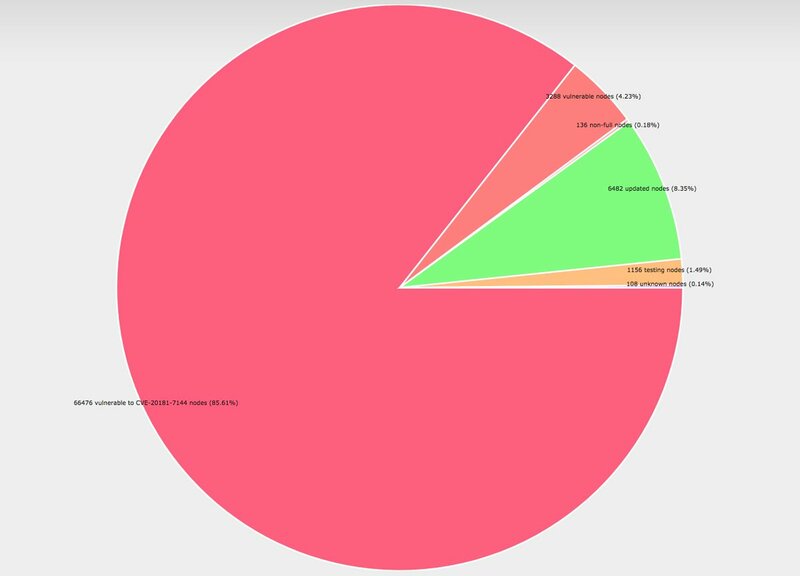 After 2 weeks, 85% of the nodes on the #Bitcoin network are still vulnerable to CVE-2018-17144 because they haven't upgraded their software. Also, I think there's a story here about UASF / BIP 148 now that we have this data.